The interest & demand for the use of window tints in many cars worldwide has been rapidly increasing, and it’s not difficult to see why. Window tints come in different a variety of degrees to cater for the different permeation limit and tolerance. If professionally installed, window tints add a lot to a vehicle aesthetically. While many people consider the use of window tint as something just to make a vehicle look cool, window tinting offers plenty of other major benefits worth considering. Excessive UV ray exposure to the human skin is known to cause a myriad of health issues such as sunburn, premature aging, suppression of the immune system, damage to the skin, and skin cancer. A professionally installed window tint can shield up to 99% of UV rays, and this is good news particularly to people who live where the sun beats down constantly. This is the most obvious advantage of window tints. The window film can reject visible light from making its way to the interior, hence making it difficult for prying eyes to see what is beyond the window. On normal circumstances, a car burglar is always motivated to commit a theft when he’s able to see what is inside the car. One major benefit of window tints is that they can reduce the heat in your car. While regular glass windows only filter about 30% of solar heat, a professionally installed window tint can filter more than 80%. The main benefit of heat reduction in your interior is the provision of comfortable and luxuriously cool conditions even during the hot summer period. The other remarkable benefit of a cool interior is that it can save on your fuel economy by lessening the need to use your air conditioning. The final benefit of a cool interior is the preservation of the car’s interior. Continuous exposure to excessive heat can lead to the development of cracks in your leather seats and fading of the interior upholstery. Tinted windows protect the glass from shattering in case of an accident. The tint film is a laminate, and when applied to the cars` window, it holds the glass window together and provides an entirely sealed unit. In the event of an accident or window breakage, the film holds the glass firmly, preventing it from shattering. Without the tint, the glass can easily shatter and spray flying pieces at occupants. The choice of whether to tint or not is a personal issue. 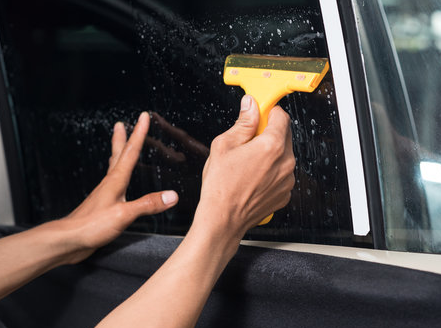 However, car window tinting is no longer a luxury as it used to be; it’s now becoming seen as a necessity. The benefits of car tinting outweigh the initial cost. Looking for Window Tints in the Monmouth County NJ Area?